The VenoPulse unit facilitates venous ultrasound reflux investigations in patients with venous insufficiency (venous dysfunction, varicose veins, venous leg ulcers). 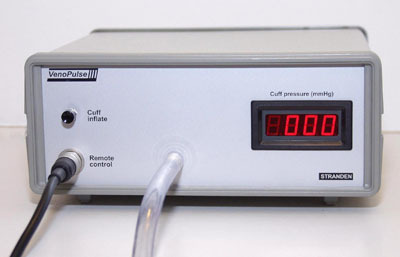 The unit rapidly inflates and deflates a pneumatic cuff placed at the calf level, activated by a foot-switch. 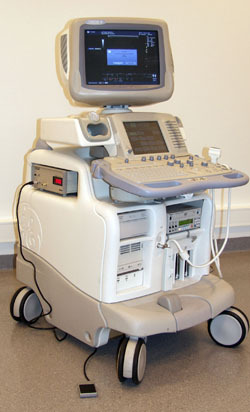 This technique eliminates the need for extra helping hands for manual calf compression, ensures the acquisition of homologous tests and enables the sonographer to concentrate on providing adequate scan images during the test. 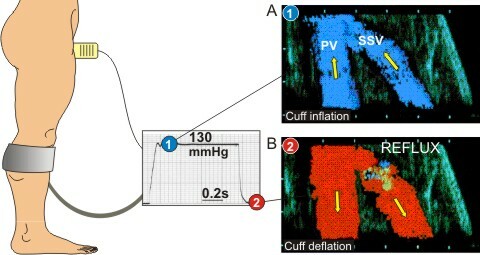 In the example below from the junction between the short saphenous vein (SSV) and popliteal vein (PV), reflux in both is verified by the retrograde blood flow during cuff deflation. Rikke Broholm and coworkers have recently published a study using the VenoPulse unit concluding that pneumatic cuff compression is superior to manual compression in examining venous insufficiency. No pressurized air connector in the room? You may connect the VenoPulse to an air compressor. A very suitable unit is described here. You find the user manual for Norway here. You find the user manual for Sweden and Denmark here. You find the user manual for Finland here.